Established in 1999, on-line national bathroom retailer VictoriaPlum.com moved into their newly built HQ in Doncaster in October 2014 after experiencing an increase in sales of £5 million a year. The new 277,000 square foot warehouse which went live in June 2015, was built with the help of Linde Material Handling’s warehouse design and simulation system STRATOS. Using this system, the experienced warehouse team at Linde Material Handling were able to collect information which was used to determine how many trucks were needed for the core fleet. This data resulted in VictoriaPlum.com switching from their previous reach truck fleet used at their old site, to a fleet of Very Narrow Aisle (VNA) equipment which makes maximum use of the space available, enabling stock to be racked right up to 14 metres. Upon completion of the new warehouse, Linde rental trucks were delivered to ensure the site was up and running immediately. This enabled the movement of VictoriaPlum.com's weekly movement of one million pounds worth of stock to be despatched to customers by a team of up to 200 employees working on the shop floor alone. 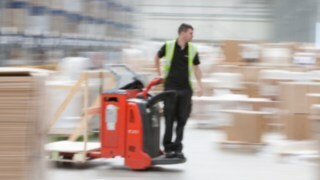 The new Linde fleet includes VNA, reach, counterbalance, order pickers and pallet trucks and even non Linde kit. Account Manager Marc Nicolson, worked closely with GNB to find the best battery solution to meet VictoriaPlum.com’s needs and also sourced a scrubber drier and scissor lift for the site. An expansion project is now underway to open small distribution hubs around the country which will also operate Linde trucks.